Samsung is hoping $2 smartphones help slow the Friday launch of the iPhone 4S. The South Korean-based company is offering its new Samsung Galaxy S II to customers in Australia for just $2 AU, according to The Sydney Morning Herald. Located just meters away from the official Sydney Apple Store, Samsung’s temporary “pop up” store opened for business at 8 a.m. today. 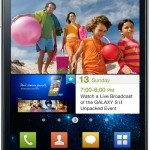 Within it, the Samsung Galaxy S II is available for just $2 for the first ten customers each day. According to the report, the line at Samsung’s Store is much larger than the one at Apple. The iPhone 4S arrives in Australia beginning on Friday at 8 a.m. local time.